I had this recipe when it first came out in 1999, made it about 4 times, and then lost it in a move. I was devastated. It was like losing a friend and I had no way to find her. This is the perfect chocolate cake. I have dreams about this cake. I have tried a dozen recipes since then that are all too eggy, too souffle-y, too flour-y, too sweet. Whenever I searched on the Epicurious site I could not find the right one. I gave up a couple of years ago on flourless chocolate cake recipes, but smitten kitchen's writer, Deb, my favorite foodie writer, posted the recipe on her site about a month ago. I was overjoyed. I even commented on the post saying "Bless you" for finding this recipe, which I thought lost forever. You cannot overlook this. It is the best excuse for eating a humongous truffle that I can think of. Follow the recipe to a T. The next day and cold is the best way to eat it. I made it yesterday for a dinner party along with Beef Korma. I didn't take any pictures, sorry. I will also have to post the Beef Korma recipe because it is divine. I've been buying whole spices and toasting/grinding them myself in my magic bullet, and it makes all the difference. I've made several Thai recipes this way. Don't be scared off by the number of ingredients because grinding the spices takes all of 2 minutes. I got it off a website (several had the same recipe) and I added the chutney and the granny smith apple. It adds the right touch. Make cake:Preheat oven to 350°F. Butter 9-inch-diameter springform pan. Line bottom of pan with parchment paper or waxed paper; butter paper. Wrap outside of pan with foil. Stir chocolate and butter in heavy medium saucepan over low heat until melted and smooth. Remove from heat. Cool to lukewarm, stirring often. Using electric mixer, beat egg yolks and 6 tablespoons sugar in large bowl until mixture is very thick and pale, about 3 minutes. Fold lukewarm chocolate mixture into yolk mixture, then fold in vanilla extract. Using clean dry beaters, beat egg whites in another large bowl until soft peaks form. Gradually add remaining 6 tablespoons sugar, beating until medium-firm peaks form. Fold whites into chocolate mixture in 3 additions. Pour batter into prepared pan. Bake cake until top is puffed and cracked and tester inserted into center comes out with some moist crumbs attached, about 50 minutes. Cool cake in pan on rack (cake will fall). Gently press down crusty top to make evenly thick cake. Using small knife, cut around pan sides to loosen cake. Remove pan sides. Place 9-inch-diameter tart pan bottom or cardboard round atop cake. Invert cake onto tart pan bottom. Peel off parchment paper. Bring cream and corn syrup to simmer in medium saucepan. Remove from heat. Add chocolate and whisk until melted and smooth. Place cake on rack set over baking sheet. Spread 1/2 cup glaze smoothly over top and sides of cake. Freeze until almost set, about 3 minutes. Pour remaining glaze over cake; smooth sides and top. Place cake on platter. Chill until glaze is firm, about 1 hour. (Can be made 1 day ahead. Cover with cake dome; store at room temperature.) Garnish with chocolate shavings or leaves. Serve at room temperature. Directions: Toast the spices in a fry pan over medium heat. Stir and remove from heat once the aroma kicks in and they are slightly browned. In a blender container combine coriander seed, cumin seed, cardamom seed, crushed red pepper, and whole cloves. Cover the blender container and grind the spices into a fine powder. Add 1/3 cup water, the slivered blanched almonds, garlic cloves, gingerroot, salt and ground cinnamon. Cover the blender container and blend till the mixture has a pasted consistency. MARIKO! You are going to be SO proud of me! 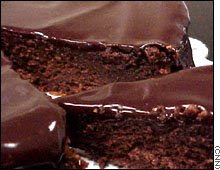 I am going to "attempt" to make the flourless chocolate cake, just for kicks! I want to see if I am able to make good food like you and Da. And when I make it, I am going to take pictures and make you good cooks proud! Thanks for the recipe! I'm sure you will be successful. It's not really that hard. If you have access to a kitchenaid you should use that for the egg white part because it's hard to get the right consistency without it. this looks great. a huge truffle? yes, please. i wish i were there for the beef korma. i'll print off the recipe and maybe someday it'll materialize in our kitchen.